As a professional enterprise of rubber air springs, our company is located in the Industrial Park of Jimo City, Qingdao, China, covering an area of 50,000 square meters, with the first phase investment of 50 million Yuan, designed annual production capacity of 800,000 rubber air springs. The company adopts internationally advanced design and manufacturing technology, production process and testing standard. 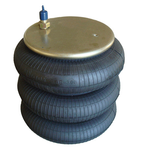 Our company has leading air spring manufacturing equipment, special molding equipment. Senho always adheres to the "honest and trustworthy, sound management philosophy, pursuing excellence, integrity, innovation, science and technology" approach as the core technology, to provide users with excellent quality products and services.